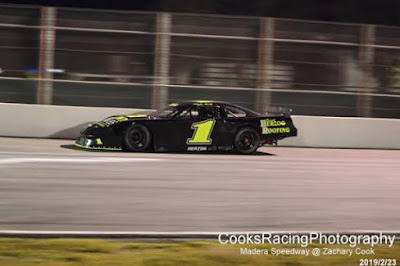 MADERA, CALIFORNIA (March 16, 2019) – Tyler Herzog put together the best 40 laps of his young career, topping a strong field of drivers for his first career Madera Late Model victory on Saturday night. 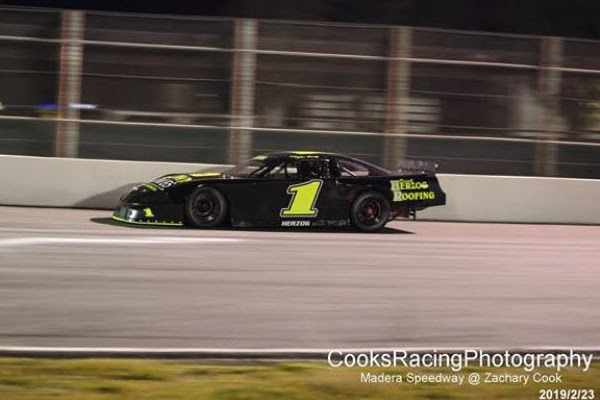 The opener for the non-televised portion of stock car action at Madera Speedway was part of a busy night, with six different main events. Herzog set fast-time in time trials and started on the pole over the 12 car field. Hailey Liles started shotgun on the field in an exhibition of her Jr. Late Model as well. Herzog jumped ahead of 51FIFTY Jr. Late Model regular Joey Iest, who was making his Open Late Model debut. Two-time 51FIFTY Jr. Late Model champion Jesse Love filed into third ahead of a great duel between another Jr. Late Model standout Jay Juleson along with his teammate Matt Erickson. Erickson, the winningest Late Model driver in Madera history, tried his best to get around Juleson while Iest kept the pressure up on Herzog. The battle for the lead tightened up on lap 12 before they separated. Things really intensified on lap 31 with Iest looking inside but getting sideways exiting turn four. Herzog managed to drive away. Herzog’s lead grew to several car lengths while Iest fell into a battle with Love for second. Liles stalled on the track in turn four on lap 36 for the only caution of the race. The caution set up a four lap sprint to the finish. Love narrowly nipped Iest at the stripe coming to the caution and lined up alongside Tyler Herzog. Herzog picked the outside line, Love was slow to get away, and that was all she wrote. Herzog went on for a .300 victory ahead of Love and Iest. Erickson cleared Juleson for fourth at the finish as well. Iest’s night wasn’t limited to just his success in the Madera Late Models. The 16 year-old also won his first career USAC Western US Midget feature. Iest led all 30 laps in the non-stop feature. Colorado’s 11 year-old sensation Elvis Rankin briefly challenged Iest but eventually drifted seven seconds behind. The best battle throughout the feature was between debutant Derek Loweree and Johnny Nichols for third. Loweree won the battle when Nichols slowed with mechanical issues. The POWRi BCRA Midgets opened their campaign in a fast-paced 40 lap feature as well. Jesse Love nipped Jerome Rodela by .019 seconds in time trials and the two Toyota powered mounts occupied the front row with the Chevrolet powered machines from Western Speed Racing taking up row two. Rodela was relentless in his pursuit for victory, winning by nine seconds while Dylan Nobile and Cody Gerhardt battled for third. Nobile pulled away in the late stages while Gerhardt’s car started to tighten late in the run to finish fourth. 2017 Modified Super Toyota champion Bert Stephens won an exciting 30 lap main event that saw the top-four run under a blanket for the duration of the race. Each driver in the pack made attempts to overhaul Stephens but were unable to do so. Stephens paced Shaun Reynolds, 2018 champion Ryan Reynolds, and Patrick Geiger across the stripe after the action-packed race. Kyle Labrie’s debut in the division netted a fifth-place effort. Jason Lawton returned to victory lane in the Toyota Sedan division with a comfortable win. Lawton had a sizeable advantage nullified by a spin in turn four by JJ Brandsen. Lawton was not deterred and built up another strong lead to the finish while Andrew Davison came home second. Brandsen worked his way through the pack to take third ahead of Thomas Magray and Andrew Parr. 2018 Hobby Stock champion Steve Schermerhorn continued his winning ways by claiming their season opening feature win as well. Madera Speedway continues next Saturday with the Smokey Hanoian Classic with Madera Late Models, Madera Hobby Stocks, MST, Toyota Sedans, Legends of the Pacific, Jr Late Model Exhibition race and Legends of Kearney Bowl. Madera Speedway is presented by major partners Nut Up Industries, 51FIFTY Energy Drink, iPull-uPull, and Color Fast Industries. Contingency sponsors include Five Star Bodies, Maita Motorsports, McCallister Precision Marketing, H&S Body Works, Hoosier Tires, and StopTech Brakes.